Seidler typified the practice of mid-century modernism in Australia more than any other. 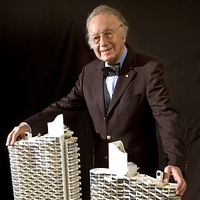 From the moment he arrived in Sydney his private homes were in demand and his uniquely stylised and innovatively engineered tower blocks came to dominate the skyline. International buildings include the Australian Embassy in Paris and the Wohnpark Neue Donau in Vienna. 2016 marks 10 years since the death of Harry Seidler and this timely documentary will deliver an exhilarating retrospective of Seidler’s architectural vision. A new film celebrating the life of Austrian-born Australian architect Harry Seidler will premiere at the Sydney Opera House on 22 October. Directed by award-winning documentary filmmaker Daryl Dellora, the film Harry Seidler: Modernist is a retrospective of Seidler’s architectural career and presents an intimate portrayal of the life and work of one of the architects who brought mainstream modernism to Australia. Seidler’s career spanned 60 years and during this time he worked in New York, Paris, Vienna and Mexico, and contributed architectural work to Sydney, Melbourne, Brisbane, Perth, Hong Kong and Vienna. 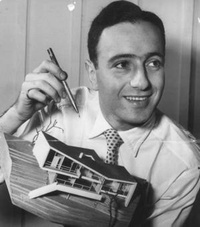 Architect Harry Seidler with model of Melller House, Castlecrag, 1950. Dellora first met Seidler when he interviewed the architect for a film about Jørn Utzon and the Sydney Opera House titled The Edge of the Possible. Seidler was 72 years old. “As soon as I spoke to him about [The Edge of the Possible], which was in the mid 1990s, I realized that he was an extraordinary character himself. It’s not often that you come across someone who has that sense of vibrancy about him and he just immediately struck me as someone who really never stopped. He was constantly going and he was constantly doing things that he thought were important and ploughing ahead against the odds really,” Dellora told ArchitectureAU. Dellora started filming in March this year and is about to finish the film, but the research phase started in the 1990s. Seidler was a prolific traveller and photographed architecture all over the world. Although he had returned to Vienna to visit a number of times, the trip Dellora joined him on during the 90s was of particular significance, as Seidler had been invited by the Viennese government to design a social housing development on the Neue Donau. “Coming back again to work and live [in Vienna] in the 1990s was a huge thing for Harry and I think he really enjoyed that because he never really stopped seeing himself as a sort of Viennese gentleman if you like. He felt very comfortable and at home in that environment, he took us around and showed us where he went to school when he was a boy, and the same school was still there. He showed us where he went and had an ice cream as a 10 year old and the same ice cream shop was still there,” Dellora said. The film includes interviews with previous colleagues of Seidler, including Colin Griffiths, who started working with Seidler in 1954, Peter Hirst, who worked with Seidler from the 1960s, and Greg Holman, who started working with Seidler and Associates in 1980. Seidler passed away in 2006 before the documentary had been made, but he self-documented his life well from a young age – from the diary he kept as a young boy to the journal entries he wrote when he was interned in Canada during World War II. His brother Marcell Seidler was a passionate photographer, and so the documentary draws on a rich archive of photographs of Seidler at various stages throughout his life. Dellora said a quote from the interview with Seidler’s wife and professional partner Penelope Evatt Seidler, which acts as the backbone of the film, highlights the crux of Seidler’s architecture career. “As Penelope Evatt Seidler says in the film, he saw himself as building a better world for the betterment of mankind, and that was a really important motivating force in his work. It wasn’t just about building something that looked good, it wasn’t just a job […] and I think that comes out of his experience in the Second World War and the fact that there’d been so much destruction at that time and he thought it was his job to build a better world – almost literally,” he said. The film premiere is being presented by the Australian Institute of Architects Foundation. The screening will be followed by a Q&A discussion with Dellora, academic of modernism Paola Favaro, and Australian Institute of Architects Foundation board member Penelope Seidler. The discussion will be moderated by Australian Institute of Architects Foundation chair, Alec Tzannes. Harry Seidler: Modernist was directed by Daryl Dellora and produced by Charlotte Seymour and Sue Maslin.